Hi all! I'm back from a day spent without Internet access...oh, the horrors! Seriously, I can live without the lights but no Internet, it's almost more than I can stand! Thankfully, our area was not hard hit by Irene...my thoughts and prayers are with those who suffered more damage. 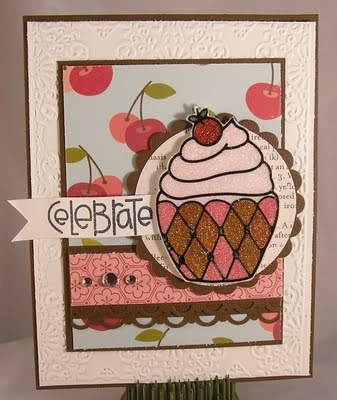 Today, I'm sharing a card that I'll be demonstrating at an upcoming Wholly Scrap! class. The class will focus on using some of those fancy new steel dies that are on the market. (And hey, did you know that Sweet 'n Sassy is offering dies now too! LOVE that!!) For this card I used the Notebook Edge die from My Favorite Things. I adore this die! I love the tiny notebook loops and how the die even creates a perforated line. So much fun!! 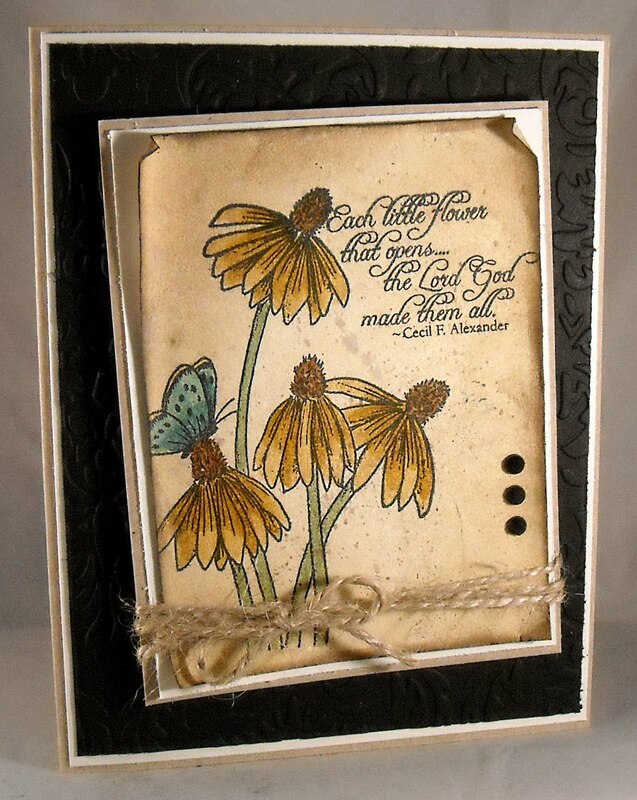 The image is a beautiful stamp from Sweet 'n Sassy called Flowers in Bloom. I love this set! 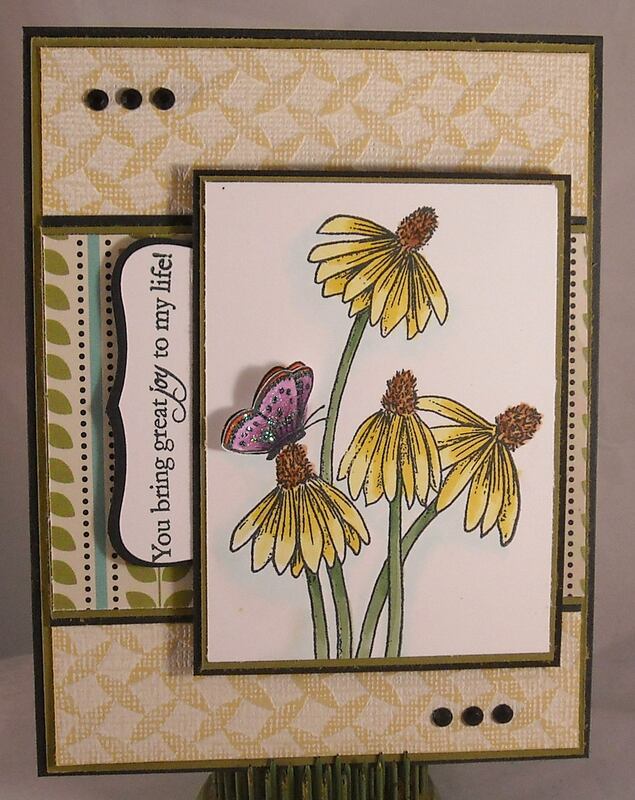 So fun and easy to color and it's the perfect size for so many card layouts. Speaking of layouts, mine was inspired by this card. (And I literally just realized that we both used a sentiment with the word "joy" in it!) 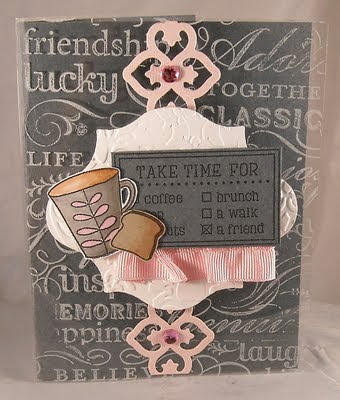 The designer paper on my card is from Pink Paislee and the ribbon is from Papertreyink. Enjoy! 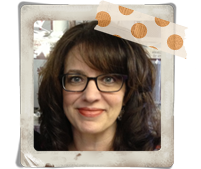 Oh, and Sweet 'n Sassy is hosting a challenge on SCS today...check it out! Happy Sunday! I'm pre-posting on Saturday night just in case we're without power and ***gasp*** Internet access today! And believe it or not I'm back with a Keep it Simple card to share! 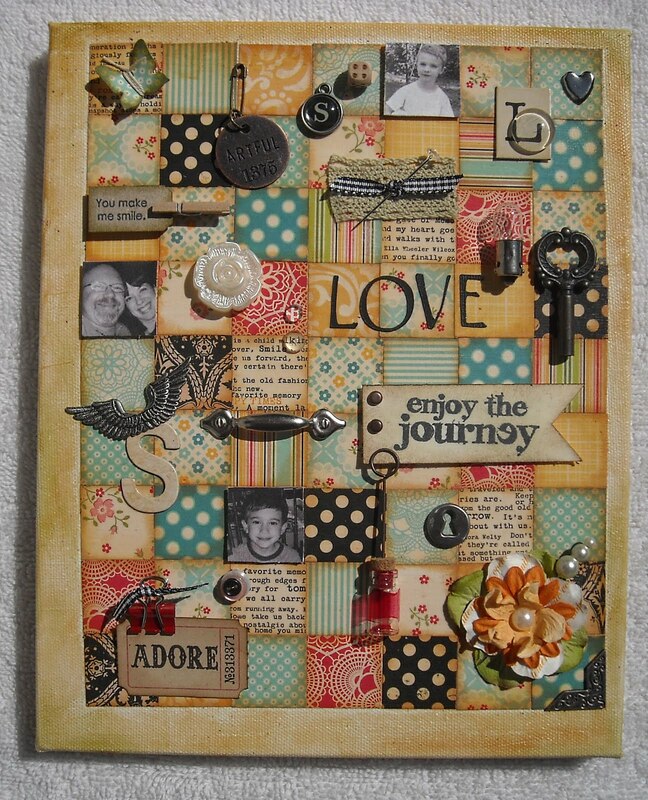 This is a sweet card layout that I CASE'd from Tammy Hershberger. (Hi Tammy!!) Tammy demonstrated stamping on acetate at our OH Stamping Around event and I loved her sweet cards so much that I had to create my own! 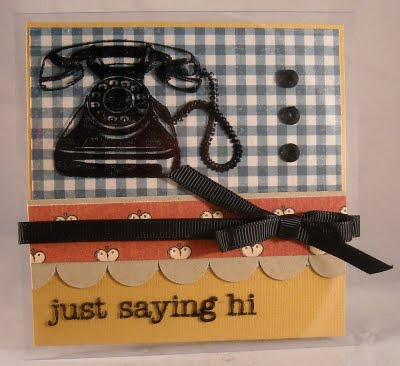 I used the Just Saying Hi stamp set from Hero Arts to create my card...love those old-fashioned phone images! The inside of the card contains the plain yellow cardstock and the blue plaid designer paper (from Graphic 45). The outside of the card contains the kraft scalloped piece and the heart paper, also from Graphic 45 (the Wizard of Oz collection). I then simply added the phone image, the sentiment (both stamped in black Staz-On), three rhinestones, and the black ribbon. Easy peasy! Enjoy! Greetings! Just a quick post to share today's card, which is one I created a few weeks ago using the fabulous Paper Smooches digi stamps! I created the cloud background with a hand cut cloud stencil and sponges. I also hand cut the tree branch, which I then embossed with a bark embossing folder from Tim Holtz. The leaves were also hand cut and attached with glue. The bird was colored with Copics and I added a sweet moss nest for her. The sun is just a punched circle with a little bit of yellow Distress Ink! Enjoy! And if you don't hear from me for a few days it's because Ms. Irene has knocked out power in New England! Will be back asap! Hey, I'm on a roll this week!! Let's go for yet another project and posting today! Yippee!! Michelle cut a bizillion 1" squares of designer paper, which the class attendees used to create the beautiful background on our 8" x 10" canvas. She then provided us with a box full of tiny trinkets, buttons, ribbon, and flowers. 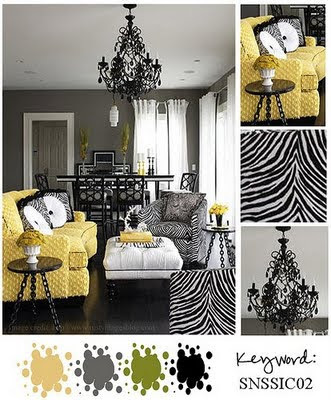 Perfect for decorating! She also used a Cricut to cut out any word or letters that we wanted. Love that we were able to personalize our canvases! We didn't fully finish the project at the store (I didn't bring photos with me) so I finished the canvas after I got home. I printed out three B/W photos and then used foam tape to pop them up ever so slightly. 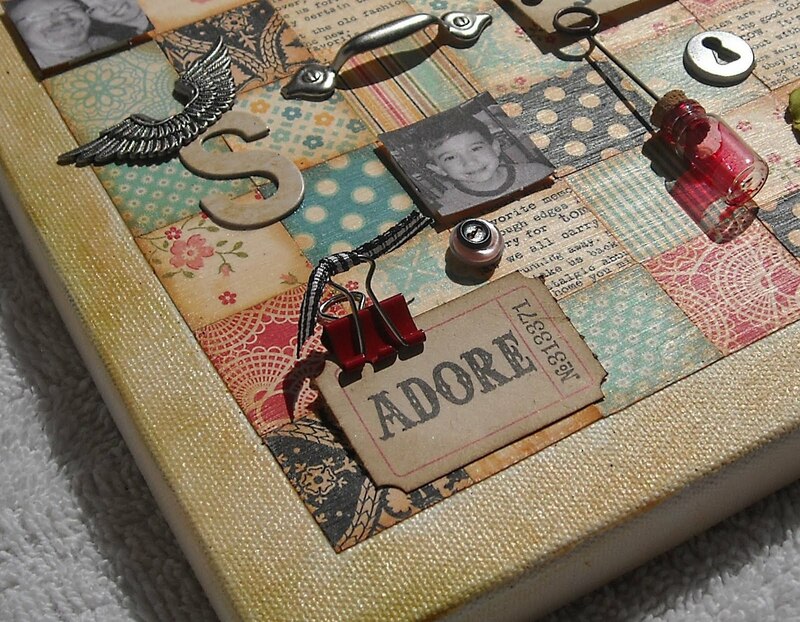 I also added the 'enjoy the journey' sentiment and an 'adore' tag. Perfect sentiments for expressing the love of life with my wonerful family. This was such a great project and I can't wait to add my canvas to my living room wall! I loved this so much that I asked Michelle to come teach at Wholly Scrap! We're looking forward to having her join our team of instructors! 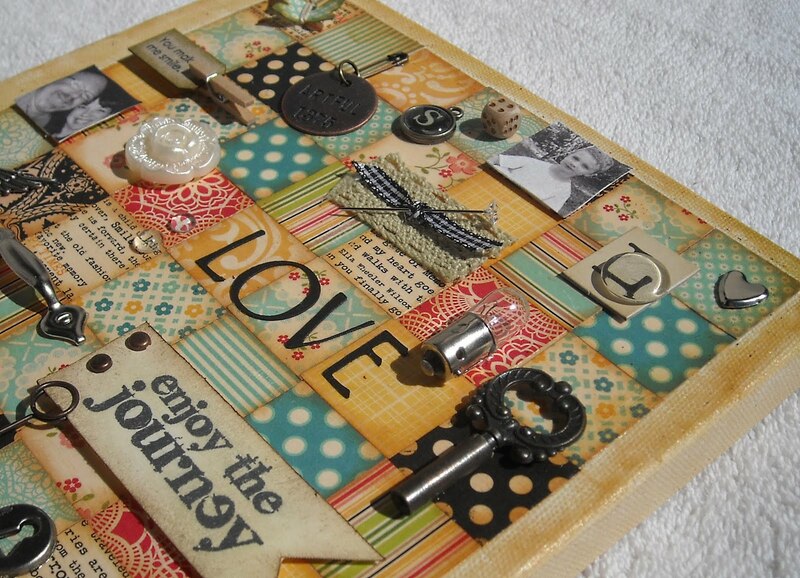 For more details, visit the Wholly Scrap! blog. Hey, I'm on a roll with posting this week!! 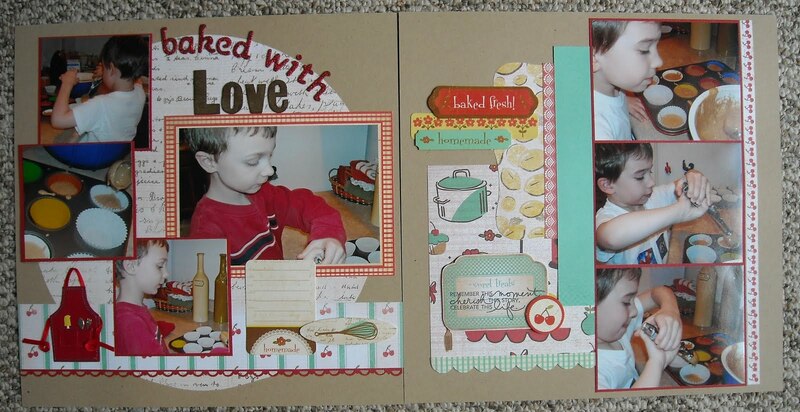 **Smile** Did you know that every Tuesday Sweet 'n Sassy posts an Inspiration Challenge on Splitcoast? If not, head on over to the Inspiration Challenge Forum to check things out! Today's challenge is a color challenge based on the picture below. Isn't that the greatest color combo? And I love the texture on the couch! Fabulous! 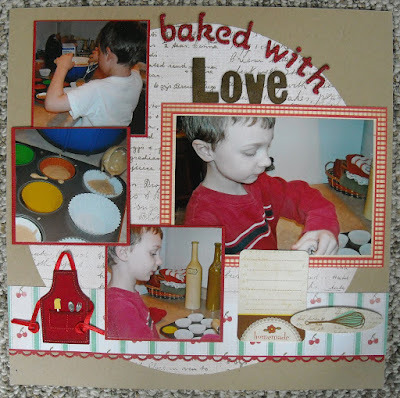 I started my card by first looking for a fun layout and I found one on the Mojo Monday blog. There were so many great layers on this week's layout that I knew it would work well for a card that would be full of color, patterns, and textures. I actually built my card before I had determined what stamp I would use! I used strips of designer paper from Cosmo Cricket and a few embossed pieces of cardstock...Had to carry over that textured theme! 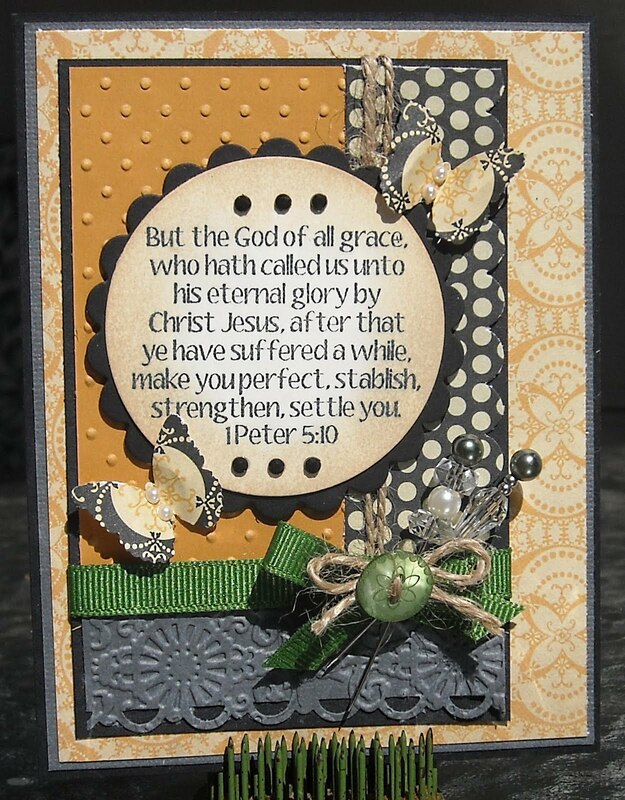 Since I had so much going on with the card design I chose to keep the image simple...a great Scripture text from the Amazing Grace stamp set was perfect! I bit of aging on the circle, a few rhinestones, decorated stick pins, and butterflies were perfect embellies. To bring in the green, I opted for just a hint of that color with the use of the ribbon and button. Enjoy and head over to the Inspiration Challenge Gallery to check out all of the visual goodness! Hey, guess what? 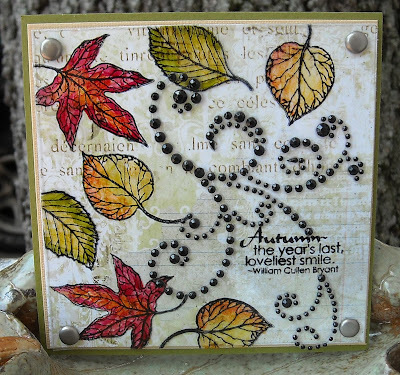 Korin was the Featured Stamper on Splitcoast yesterday! I had to create a card to add to the gallery! Here is the card that inspired me in Korin's gallery: Inspired Tree. I love, love, love the text in the background of Korin's card! I created mine by first masking off a sun and using Distress Inks to create the background. (Yes, I know...yesterday's card consisted of a mask, a sun, Distress Inks...but I love this technique, I can't help myself!) I kept the sun mask on and then used the French Script background stamp from SU! to add the text. 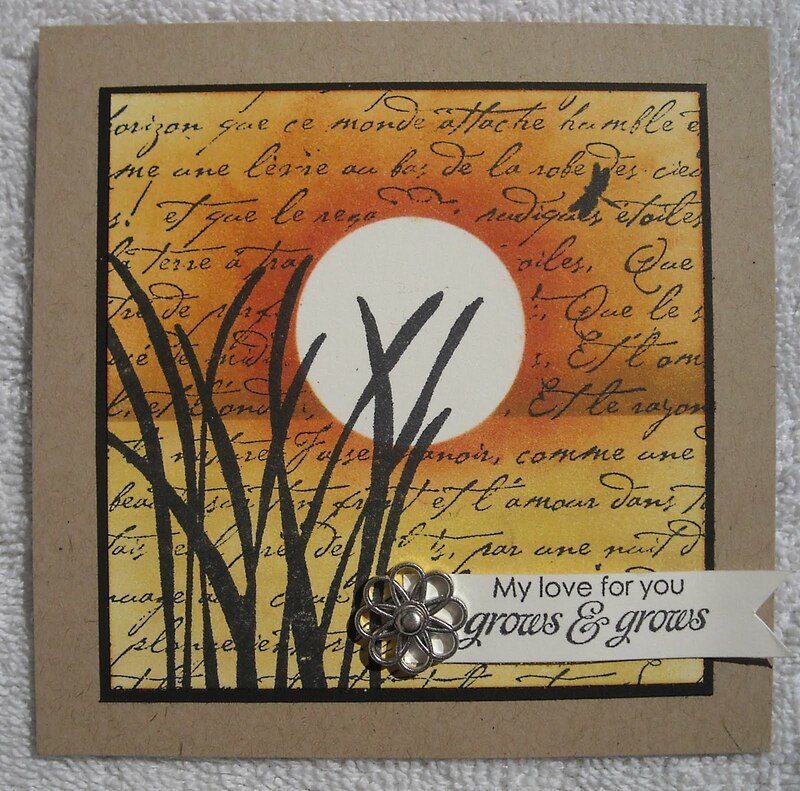 The next element was this great grass image from the Serene Silhouettes stamp set. The dragonfly is from the same set. And then I added a sentiment from the set that Korin used on her card, Love is Like a Tree. The brad is also from SU!, the cardstock colors are the same as Korin's card. Enjoy and why not stop by SCS to check out the Featured Stamper gallery!! It's been ages since I've had a KSS card and this card that I created for last week's Sweet 'n Sassy release party is the perfect fit! The leaf image on this card, and sentiment, is from the newly released Autumn Leaves stamp set. Isn't it pretty! Check out the entire new release on the SNSS web site! The creation of this card was simple...I created a mask for the circle, using a Nestibilities die, and then colored in the circle with a variety of Distress Inks. I then stamped the sentiment half in the circle, half out (after removing the mask of course!) The leaf was stamped on a scrap of cardstock, colored with Copics, and attached with foam tape. Three little rhinestones - my obsessive "go-to" lately, finished off the card! I should also mention that this is a smaller than average card, 4.25" square. This card features a background stamp from SU!, which I stamped in white Staz-On ink. The inside of the card is just plain gray cardstock, which has been folded in half and attached to only the back of the acetate card. The pink band was created with a Spellbinders die. This was the first time I've used a decorate edge die and I love it! Great way to add a fun embellishment to cards! My center white piece of cardstock was cut out using a Nestibilities die and then run through the Big Shot with an embossing folder for added texture. The images are from a Hero Arts stamp set, What's Perking. Isn't the toast image a blast! Love it! I simply colored the images with Copics, cut them out and popped the up with foam tape. I also added a fun pink ribbon, from American Crafts, to the bottom of the sign. And PS - Adore the pink/grey color combo!! Thanks for stopping by, enjoy today's card! Today I'm sharing another card using the beautiful new set, Flowers in Bloom. I took a fairly simple approach to today's card, focusing more on aging the paper that highlights the floral image. I used distress inks, water, and some paper crinkling to age the paper and then I stamped the image. The black cardstock in the background was embossed with a Sizzix embossing folder and then I matted the image on cream and kraft cardstock before attaching to the base. A quick addition of some twine and rhinestones (I've suddenly become the queen of adding three rhinestones to all of my cards!) were the perfect finishing touches! Be sure to clear your schedule at 8pm tonight and join us for our release party...It's going to be a blast!! Am I the only one who starts singing a David Bowie song when I think about a blog post with the word 'changes' in it? :-) Well...there have actually been a lot of changes going on over on the 'ol Paperie Petals blog for the past few months but I haven't gotten around to blogging about any of it...until now! I'm super excited to announce that I'm joining the PSA Essentials Design Team! 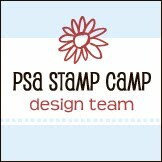 (You can read all about the newbies here) I stumbled on PSA stamps a few years ago and thought they were very interesting and different so when I saw that they were looking for DT members, I thought I'd give it a try! PSA manufactures self-inking custom stamps. They have a variety of styles and ways to personalize. The stamp comes ready to go, with black ink already assembled so you can start stamping right away. There's no assembly required! Their stamps features a patent-pending PEEL & STICK® technology. Peel away your inner or outer ring and stick on a new one for added customization and design. Think of it as “switchable middles!” You can read more about their products on their web site. Enjoy your day and be sure to check out the new DT list on the left hand side of my blog! Welcome to the next Sweet 'n Sassy sneak peek! Have you been following along with the sneak peeks this week? You can find them all on the Sweet 'n Sassy blog! Be sure to check out all of the design goodness!! 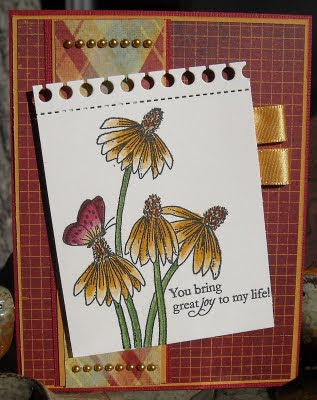 Today I'm sharing a card that features the soon-to-be-released stamp set, Flowers in Bloom. Hello, flowers? I couldn't be happier!! This set features this beautiful floral image and a number of sentiments. I paired my image with embossed Core-dinations paper and if you've never used this paper...go out and buy some, it's so much fun! The paper has already been embossed with various designs and then when you sand the paper, the design is revealed. Fun! I also added a strip of designer paper from October Afternoon. The image has been colored with Copics and my butterfly stamped twice so that I could cut out one butterfly and pop up the wings...also added just a hint of Stickles. Enjoy today's card and be sure to check out the blog for links to other sneak peeks using this same set! To make these images you place one of the outline stickers on top of a sheet of wonder tape (also called Red Line tape). You'll want the sheets of these tape, not the roll. I cut out a piece of wonder tape that was just a bit larger than the sticker. I then poured a very fine white/clear glitter over the wonder tape, pressing down to adhere the glitter to the glue. Shake off the excess and then...color right on top of the glitter with Copic markers!! Love, love, love the results! Isn't it the coolest thing ever! It's even more shimmery in person!! I ended up cutting out the cupcake image and used foam tape to pop it up on a Nestibilities circle. (The designer paper is from October Afternoon). Oh, and the sentiment is from Paper Smooches! That's right, I got myself a whole lotta Paper Smooches stamps! Enjoy today's card and be sure to check back tomorrow for some fun news!! Sweet 'n Sassy Sneak Peeks! 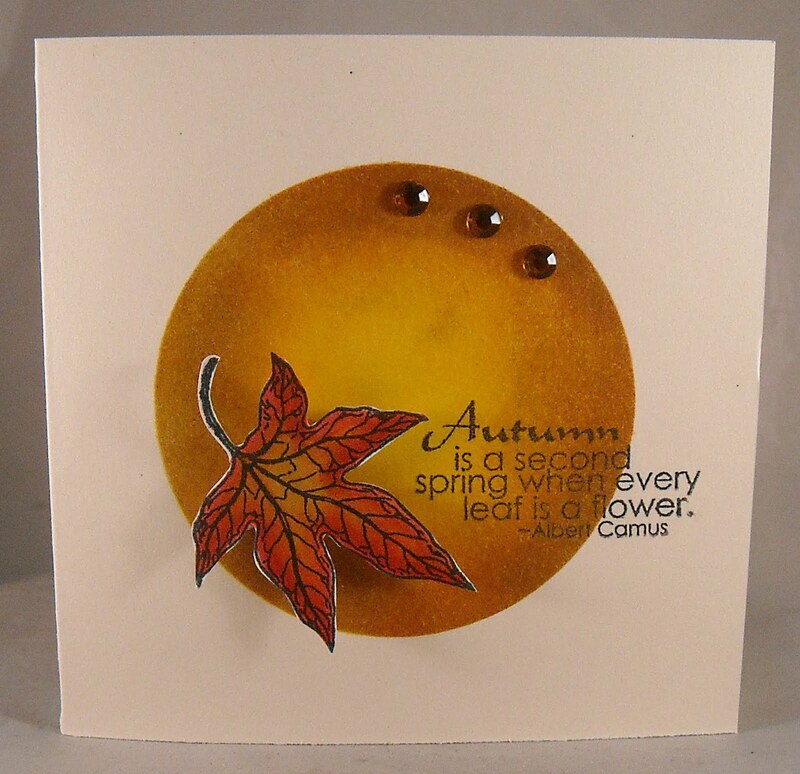 Today's card is featuring the stunning new set titled, Autumn Leaves. I love leaf images as much as I love floral images. So much you can do with them and they're so pretty!! I have a feeling that I'm going to using this stamp set a lot! I tried out a new technique - well new to me - with this card. Stamping and coloring on acetate. I had this idea after looking through tutorials on Michelle Zindorf's blog (I love Michelle and her work, so beautiful!) I think she used dye inks and a watercolor brush to color her images but I opted to use Copics, which worked perfectly. I first stamped the leaf images on to my piece of acetate and then I turned the acetate over and colored on the non-stamped side. I found that I was even able to do just a bit of shading with the Copics, although you need to work fast as the ink dries almost instantly. I then stamped the sentiment on the front, added some bling and brads and my card was complete! Oh, I did use some lovely patterned paper under the acetate, this paper is from Pink Paislee...a wonderful soft, vintage print. What to see some more lovely artwork created with this stamp set? Check out the following DT blogs or visit the Sweet 'n Sassy blog for more info! 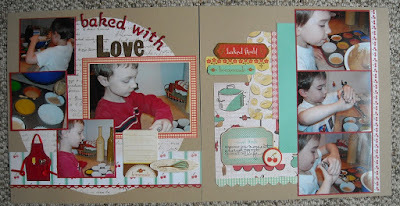 Today we're having a layout challenge on the Wholly Scrap! blog, check out all of the details here! For these two pages I used designer paper from Kaiser Craft, the Nan's Favorites collection along with a number of coordinating die cut elements. This paper has a great vintage design to it and I love the little touches of aqua and red. I highlighted the red by using red glitter covered letters and then paired those with the toned-down look of the grunge letters, which were colored using Distress Ink. 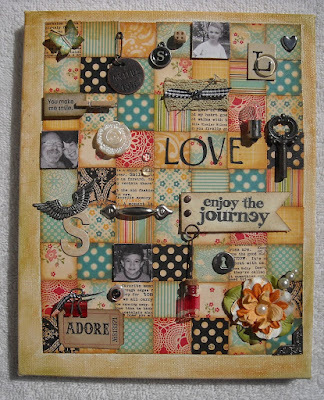 More of those fun die cut elements on this page, the cherries, journaling box, and sentiments at the top of the page. And see those cherries running along the right hand side of the photos? That was the tiny strip of paper at the bottom of every 12x12 sheet of paper, the one with the UPC code on one side! Love to use those scraps!! 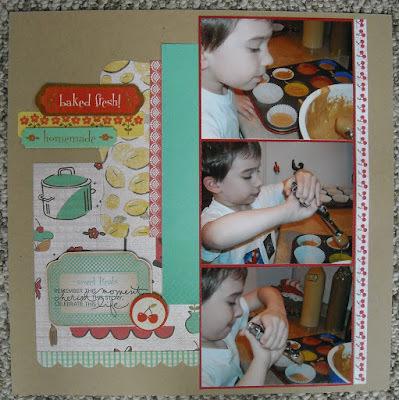 The stamps sentiment, seen on the journaling tag, is a stamp from Ali Edwards. You can purchase her stamps, which are awesome for scrapbooking, at Technique Tuesday. Enjoy today's craft and be sure to check out the challenge details on the Wholly Scrap! blog! Greetings friends!! I'm continuing the Wholly Scrap! challenges today, you can check out all of the details here, and today's challenge is a color challenge! Our colors are orange, yellow, & blue. Swatch colors can be seen on the Wholly Scrap! blog along with submission and prize details. Check it out! Today's card features a darling image from Sweet 'n Sassy. 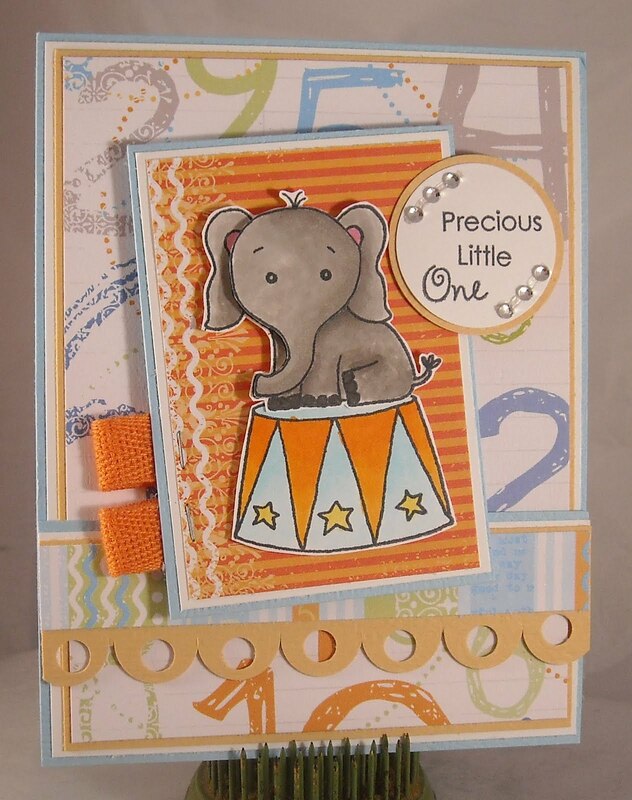 This little sweetie elephant is part of the Baby's Circus stamp set, which comes with three baby animals, the circus podium, and a whole bunch of sentimewords that can be mixed and matched to create custom sentiments. This is definitely one of my favorite baby sets!! 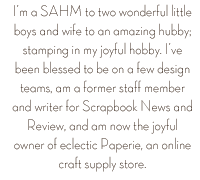 The designer paper on my card is from Little Yellow Bicycle, the Baby Saurus line. I colored the elephant with Copic markers and then stamped another head, colored it, cut it out, and attached it over the original elephant head with foam tape. You know...I can't live without foam tape! :-) The little bits of ribbon are an orange twill from Wholly Scrap! Enjoy and be sure to stop by the Wholly Scrap! blog to read all about our two weeks of challenges! Welcome friends!! 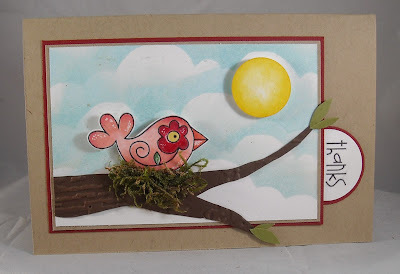 Today I'm featuring a card made with products from Wholly Scrap! For the next week weeks, I'm going to be hosting challenges over on our store blog and we'd love to have you play along! Prizes will be given for challenge winners and we'll gladly ship to anywhere in the US (sorry my dear international friends!!). You can check out all of the details here. My card was created using paper from Graphic 45, "The Magic of Oz" collection. Love the last few releases from Graphic 45, perfect for creating without even stamping! I used a cut our of Dorothy as my focal point and then built upon that by adding vintage stick pins, red glitter stars, and black rhinestones. 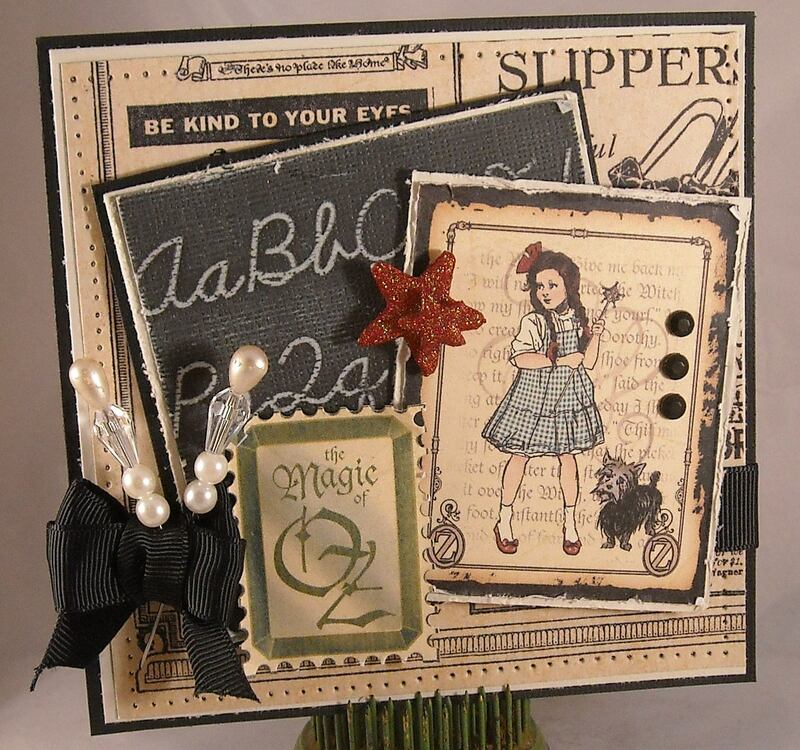 The alphabet paper is from Core-dinations and is actually part of today's Wholly Scrap! Takeover Challenge. I'll be back on Wednesday with another challenge and a Sweet 'n Sassy card to share!! Check back and enjoy today! !